HAVANA, Nov 7 2017 (IPS) - Based on protein plants, pasture and fodder, Orlando Corrales produces cow and goat milk on a farm located next to a major road in the Cuban capital. “We do not use any industrial feed here,” he says proudly. 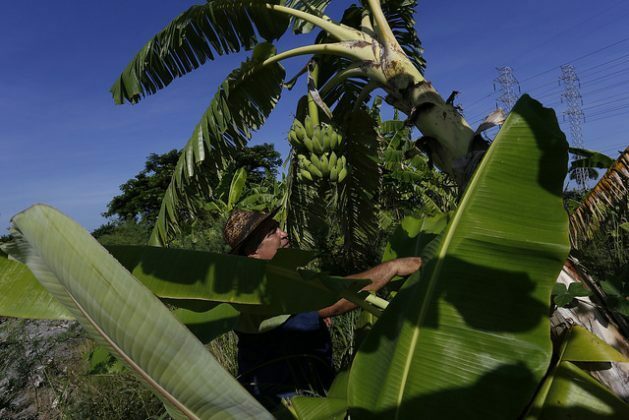 Calm prevails on the seven-hectareJibacoa farm, despite its proximity to the heavy traffic on Boyeros road, in the southern outskirts of Havana. In the stables, the cows, goats and sheep eat a mixture of several plants that Corrales grows on his not very fertile land, where he raises livestock and grows fruit trees. “You can replace the feed with these plants because they have a high level of protein,” said the farmer, who grows, even in the living fences that surround his farm, more than 15 varieties of plants to feed 32 cows, 36 goats and 54 sheep, besides experimenting with breeding rabbits and guinea pigs. In his own way, Corrales follows the recommendation of specialists aimed at helping small farmers like him to boost production of meat and milk – two food items that are scarce on the tables of Cuban families and are among the most expensive in local markets. In this Caribbean island nation in recession, the limited availability of industrial animal feed, produced and imported in low quantities, is one of the factors threatening livestock-raising, with the resulting impact on local food security. For this reason, state research centers, together with the Ministry of Agriculture and farmers such as Corrales, are promoting the use of shrubs such as moringa (Moringa oleifera), mulberry (Morus) and red sunflower (T. rotundifolia) to feed livestock on small farms that often adverse climatic conditions such as drought. “Many of these forage plants stimulate the production of milk in females,” added Corrales, who in 2016 produced 1,800 litres of goat’s milk, 6,000 litres of cow’s milk and three tons of tubers, fruits and vegetables. Additionally, his farm supplies a natural juice store and a stand in an agricultural market. Thanks to training received and accumulated experience, Corrales, who is a mechanical engineer, today makes “a nutritionally balanced diet for animals with these plants, especially for those pregnant or milking. Everything is milled in forage machines and mixed with other foods,” he explained. “We have moringa, red sunflower, mulberry, and the hybrid grasses ‘king grass’ and common grass. We intersperse fodder within banana plantations for example, and we use the leaves and stems for animal feed. This is the Inca peanut (Plukenetia volubilis),” Corrales said during a tour of his farm, which he was leased in 2008 by the state as part of a land redistribution process. “We also grow sugar cane, which does not provide much protein but does provide energy and good flavour, piñon florido (Gliricidia sepium), Chinese hibiscus (Hibiscus rosa-sinensis), gumbo-limbo (Bursera simaruba) and poplar (Populus)… we have a bank of seeds of these plants and a lot of food even for times of severe drought,” he told IPS. Although he has pending challenges such as making use of the parts of his farm that are still idle, incorporating semi-confined livestock production systems, and growing hay, Corrales’ use of pastures, fodder and protein plants demonstrates that it is possible to replace traditional mixed or compound feed. 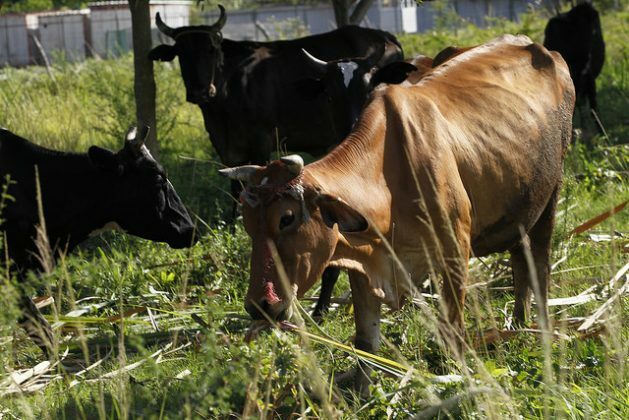 “The recommendation in the tropics is to feed cattle with more than 70 percent of local pastures and fodder, and the rest of the deficit protein is complemented by protein plants,” agronomist Francisco García, president of the non-governmental Society of Production of Pastures and Forage in Havana, told IPS. Facing resistance from farmers, the agricultural sector established in 2011 a programme to promote the use of protein plants and expand their cultivation in the country. The best-known among the local population is moringa, to which late former president Fidel Castro (1926-2016) dedicated several of the columns he wrote for the local press. Even in parliamentary meetings, the deficient local production of animal feed has been analysed as an obstacle for the increase in meat and milk supplies for the local population. The only successful experience identified is pork production, which has grown steadily by 10,000 tons per year. In 2016, the equivalent of 338,000 tons of pork on the hoof, 167,000 tons of cattle and 39,000 tons of barnyard fowl were slaughtered in Cuba, according to figures from the state National Bureau of Statistics and Information, which include livestock raised in backyards. The production of cow’s milk totaled 594 million litres, which is below demand in this country of 11.2 million people. Several sectors of Cuban agriculture suffered a decline in the first half of 2017, compared to the same period of the previous year, due to longstanding problems of deficiencies and the severe 2014-2017 drought. The outlook may be worse at the end of the year, due to Hurricane Irma, which hit the north coast of Cuba in early September. Currently there are 3,979,700 head of cattle, 56,700 water buffalo, 2,376,000 sheep and 1,154,300 goats. “In Cuba we have to introduce alternative products to lower the costs of animal production, in order for it to be sustainable,” said researcher Lourdes Lucía Savón, who is studying other ways to locally feed livestock. Savón told IPS that traditional foods made from “corn and soybean make animals grow faster” but warned of a little-known problem. The scientist clarified that alternative feeds “are very difficult to produce on an industrial level”, which is why their use is recommended “in medium and small-scale productions”. Due to the importance of the issue, the United Nations Food and Agriculture Organisation (FAO) promotes national efforts in this regard. It even supported the preparation and publication of the book in which Savón participated along with other colleagues from Cuba, Ecuador and Venezuela. “Good scientific studies have been produced in Latin America and the Caribbean in response to the need to find forage sources to increase livestock production. This is a global challenge,” FAO representative in Cuba Theodor Friedrich told IPS.